Group B Streptococcus (GBS), a bacterial pathogen that causes sepsis and meningitis in newborn infants, is able to shut down immune cell function in order to promote its own survival, according to researchers at the University of California, San Diego School of Medicine and the Skaggs School of Pharmacy and Pharmaceutical Sciences. Their study, published online July 13 in the Journal of Experimental Medicine, offers insight into GBS infection – information that may lead to new medical therapies for invasive infectious diseases that affect nearly 3,500 newborns in the United States each year. 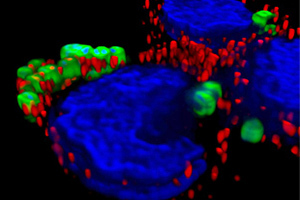 Group B Streptococcus (green) binds Siglec-5 (red) on the surface of a human macrophages, shutting down their activity. DNA strain (blue) highlights nuclei of the human cells and bacteria. The findings represent a collaborative effort between the laboratories of senior authors Nizet and Ajit Varki, MD, distinguished professor of medicine and cellular and molecular medicine. Varki is also co-director of the UCSD Glycobiology Research and Training Center, where the investigators have been exploring the interaction of bacterial pathogens with the innate immune system. Their most recent focus has been on the special role of Siglecs (short for sialic acid binding Ig-like lectins), members of the immunoglobulin family of antibodies. Siglecs sense a chemical structure known as sialic acid – a sugar molecule that is abundant on the surface of all human cells – and send signals that control the gene expression and function of immune cells. Many specialized Siglecs receptors send negative signals, recognizing sialic acids as “self.” These signals help keep the immune cells turned off under baseline conditions, avoiding unnecessary inflammation in the absence of infection or injury. Earlier this year, in a manuscript published in the journal Blood, the same UC San Diego team demonstrated that GBS decorates its own surface with sialic acid, closely resembling human molecules, and is thus able to bind Siglecs on immune cells, shutting down the cells’ normal functions. In the new study, the researchers discovered that GBS can also bind a human Siglecs receptor through a particular protein expressed on the bacterial surface. This is the first time a protein has been reported to functionally interact with Siglecs, and presents the possibility that additional pathogenic microbes may have evolved similar ways to manipulate the human immune system. According to the study’s lead author, Aaron Carlin, MD, PhD, when GBS proteins bind to Siglecs, it profoundly affects immune-cell function by decreasing its ability to engulf the bacteria, a process known as phagocytosis. “The immune cells reduce their production of antibiotic molecules, allowing the GBS bacteria to survive the encounter and proliferate,” said Carlin, who recently completed his doctoral studies in UC San Diego’s Medical Scientist Training Program. Siglecs are among the most rapidly evolving parts of the human genome. This suggests that strong natural selection pressures are present to modify their expression, according to Varki, with pathogenic microbes likely playing a critical role. “There are important variations in Siglec expression and function between humans and other species, among human populations, and across the age spectrum. Evidence is accumulating that Siglecs may profoundly affect susceptibility or resistance to several important infectious diseases,” said Varki. According to the UC San Diego researchers, the new study likely has broad implications for understanding the propensity of certain bacterial pathogens to produce human disease. It also explains why some individuals or groups may be more predisposed to suffer more severe outcomes than others. Approximately 20 to 25 percent of women of childbearing age are asymptomatic carriers of GBS on their vaginal mucosal surface. Newborns can become infected with GBS that invade through the placenta to initiate infection in the womb, or during delivery by exposure to contaminated vaginal fluids. Screening of pregnant women for GBS and antibiotic prophylaxis during labor is used to reduce the risk of newborn transmission, yet it estimated that approximately 3,500 newborns still develop invasive GBS infections annually in the United States. In addition to neonatal disease, GBS is increasingly associated with serious infections in adult populations such as pregnant women, diabetics, and the elderly. This study was financed by grants from the National Institutes of Health. Co-authors contributing to the study were Yung-Chi Chang, PhD and Charles King, PhD, of the UCSD Department of Pediatrics; Nancy Hurtado-Ziola, PhD of the UCSD Department of Cellular and Molecular Medicine, and Thomas Areschoug, PhD, and Gunnar Lindahl, PhD, of Lund University in Sweden. Copyright ©2010 Regents of the University of California. All rights reserved.